I tend to prefer markers to crayons but I just purchased some Prang soy crayons and I love them. They are made with soy oil rather than petroleum which makes them better for the environment and I find they go on more smoothly and prefer the color and surface they create. I also got a set of recycled crayons which are made by Crazy Crayons, a company in Wisconsin which employs people with developmental disabilities. When I showed them to my husband, he said, where do they get the crayons from? Are there that many extra crayons in the world? I showed him my box of crayons some of which date back to the sixties, if not the fifties. So the answer is yes. 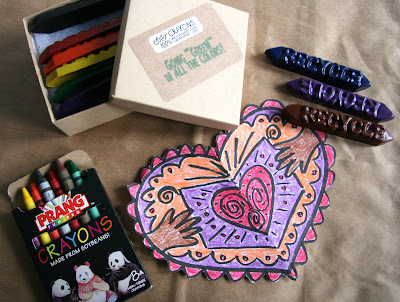 In the valentine, red and orange were colored with soy crayons, purple and brown with recycled crayons. You can purchase the soy and recycled crayons from Stubby Pencil Studio which has a lot of eco-friendly art products for kids. You can recycle your crayons by sending them to Crazy Crayons. Thanks I will look for these crayons and give them a try.